Loads of fun, but it's no toy. For great low-volume sounds at home, this is a no-brainer. Tiny box, but not too boxy sounding; good range of features. Bass and treble pots wouldn't go amiss. We'd still go for the HT-5. Small enough to fit almost anywhere you'd like to put it. When connected to a larger cab, the HT-1R really starts to come to life. Connect you iPod and some headphones and it's practice heaven. 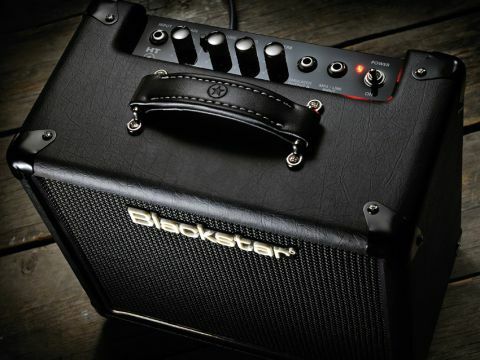 You have to hand it to Blackstar: the new company appeared virtually out of nowhere in 2007, and as we click into 2011 it's without doubt one of the leading brands in valve guitar amplification, certainly in the low/mid price sectors. Its most successful model, the HT-5, offers lots of features in a small, convenient package at an extremely competitive price. But it seems even five watts is too much for some folks, so enter the HT-1 - a fully featured valve combo putting out the grand total of one whole watt. "We never expect much from digital reverbs but this does an exceptional job of emulating a classic long-tank spring reverb. It's the best we've heard in a cost effective amp." Cynics beware… Outwardly, the HT-1 bears Blackstar's now established smart black livery, quality metal pots and general feeling of high build quality and finish. And boy is it small - we don't know whether to put it on the floor, on a shelf, or knit a little jumper for it, as you would one of those handbag-sized dogs. In short, only the most unreasonable of significant others will ban it from any part of the house. The single channel runs off a lone ECC83 preamp valve and has two modes, selectable via a top-panel switch. With the switch out you're in clean to crunch mode, and with it in it's all about heavier overdrive. Then you get a gain and master volume set-up followed by Blackstar's trademark ISF control. Rather than spanning vaguely woolly to vaguely tinny like most single tone pots, this one shifts the whole EQ curve, which has the biggest tonal effect in the mid frequencies. Blackstar says this mimics the harder mids and tighter bottom end of classic British amps, through to the more scooped mid-range and blooming bottom end of classic American amps. Finally there's a master reverb control (note the presence of an 'R' in the model name) to control the digital reverb circuit. You also get a couple of functional extras: most usefully an emulated/headphones out that enables you to connect directly and silently to a mixing console or soundcard for recording, and also to practise without disturbing the neighbours. In either environment, it sounds surprisingly good. There's also an mp3/line input should you want to jam along with your iPod/phone/CD player or what have you. The single eight-inch guitar speaker isn't going win any hi-fi awards when it comes to backing track playback, however. Finally, you have an 8-ohm speaker output, which when connected, cuts off the HT-1R's internal speaker. We tried it with 1 x 12, 2 x12 and 4 x 12 cabinets with impressive results - as you can imagine, the HT-1R is a different beast entirely through a bigger, more powerful speaker cabinet. Power comes from a not-that-common ECC82 dual triode that's using its two halves to run in class A/B push-pull configuration - many single output-valve micro amps tend to run in single-ended class A. Not very loud is the first impression of the clean mode, until you start cranking the master. Clearly, it's a bit much to expect foundation-shaking levels from a single watt, but in terms of clean headroom, the HT-1R is very limited. It'll out shout the TV at normal volumes, but if you want more, you'll be into light, classic overdrive, which the HT-1R does extremely well. Playing with the ISF tone control spans more strident, attacking, punky mids, through to what you might think of as more 'Blackface' Fender territory: good Keef-type rhythm sounds, for example. We'd still like a bass pot or some kind of low-end attenuation, however, especially when played through larger cabinets. The onboard reverb is a bit of a star. We never expect much from digital reverbs - they tend to sound clunky and, well, digital - but this does an exceptional job of emulating a classic long-tank spring reverb, certainly the best we've heard in a cost-effective amp, and a real boon on a tiny amp. Switching to the overdrive mode brings a huge extra swathe of gain and a kick in volume too. Blackstar's overdrive tends to be very smooth and harmonically rich - somewhere between classic modded Marshall and Mesa/Boogie territory is a loose ballpark - it's thick and fat, not harsh and yet still offers good note separation. The HT-1R delivers gain levels that will satisfy melodic/technique rockers in the vein of Mssrs Vai, Satch and Gilbert, though it stops just short of the latter's all-out aggressive edge. The limiter is the tiny speaker and cabinet. Sure, it sounds bigger than it has any right to, and much less 'boxy' than you might imagine, but unleashed into a bigger cab it really starts to open up with many of the tonal hallmarks of a cranked bigger amp's power section. With the proliferation and sheer quality of amp emulation software for computers, mobile phones, iPads and the like, we often wonder if the practice amp's days are numbered. The Blackstar HT-1, however, is a significant shot over the digital bow in that it's child's play to set up and use, sounds extremely impressive and is super cute: and it has object value, which no bit of software ever will. No, it doesn't sound as fully formed as the more grown-up HT-5, but we'd wager that's Blackstar's intention. If you're limited for space and just want a simple, tiny box with reverb for home and practice, there's no other credible choice at this price. Impressive.